Much attention was paid this week when rumor spread that an Irish academic named Linda Hogan may well become the first female cardinal in Rome. “She’s married and a feminist to boot, but Irish theologian Linda Hogan is being touted as a candidate to become the first female ‘prince’ of the Catholic Church,” is how the New York Daily News breathlessly reported the rumor. Nevertheless, the rumor seemed to confirm the feeling that Pope Francis may indeed support radical change within the Vatican. What did not receive much attention this week was an actual appointment Pope Francis made. 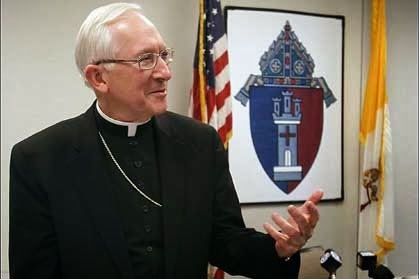 Leonard P. Blair, the bishop of Toledo, was named archbishop of Hartford. Just over a year ago, a group of nuns led by Irish American Pat Farrell were causing some trouble by speaking out on women’s issues and the church. The group, officially known as the Leadership Conference of Women Religious (LCWR), challenged fundamental aspects of church theology, raising questions about issues ranging from abortion to the ordination of women into the priesthood. “I think there are many issues in the Catholic Church right now that could leave the faithful somewhat demoralized,” Sister Pat told NPR earlier this year. In light of these comments, it is tempting to see the rumor about a female cardinal as a breath of fresh air, a possible step forward, a new beginning for the church and its relationship with women. Which brings us to our friend Leonard P. Blair, the newly-minted archbishop of Hartford. Blair assumed this position on October 29, just days before the rumor broke that we might have an Irish female cardinal. Pope Francis, of course, appointed Blair to his new position. Blair is no stranger to the Vatican. He was also charged, a few years back, with investigating a certain nuns’ organization that had been vocally critical of the church and its treatment of women. That’s right. When the Vatican needed someone to take a close look at pesky Sister Pat and the Leadership Conference of Women Religious, it was Blair who submitted a report that was critical of the organization. Blair personally expressed “great disappointment” at LCWR’s leader Sister Pat, who suggested the church may want to consider its blanket opposition to abortion. More broadly, Blair argued that LCWR should think again about trying to reform the church. “If by dialogue (LCWR) mean that the doctrines of the church are negotiable and the bishops represent one position and the LCWR presents another position, and somehow we find a middle ground about basic church teaching on faith and morals, then no,” Blair was quoted as saying in 2012. It’s not to say that rumored Irish female cardinal Hogan is not a fascinating person. A vice provost of Dublin’s Trinity College, she is also a founding member of the International Association of Catholic Social Thought. She’s also written several books on gender and religion, including "Feminist Catholic Theological Ethics: Conversations in the World Church." However, while the rumors about a female cardinal may make an interesting story, the elevation to archbishop of Leonard Blair by Pope Francis might actually say a whole lot more about how church big wigs feel about women.